Kiss oily skin goodbye with the Greenberry Organics Green Clay Mud Face Wash. It is a one-stop solution for normal to oily skin type, as it is rich in multiple minerals like dolomite, manganese, silica, copper, phosphorous, magnesium, zinc and calcium. 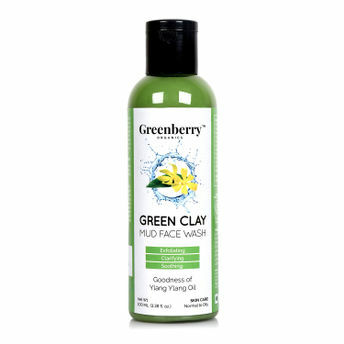 Enriched with French Green Clay, this face wash helps in removing the toxins from the face by gently cleansing the pores and getting rid of free radicals while Ylang Ylang Oil known as a skin soother & natural toner that adds up to clarifying the skin with its natural anti-bacterial properties. This facewash controls bacteria and promotes fresh and clear skin. Greenberry Products are: 100% Vegan and free from Parabens, Sulphates, Silicones, Alcohol, DEA/TEA, Artificial Fillers, Mineral Oils, Phosphates, Paraffin Wax, Phthalates, Petrochemicals & Synthetic Colours.